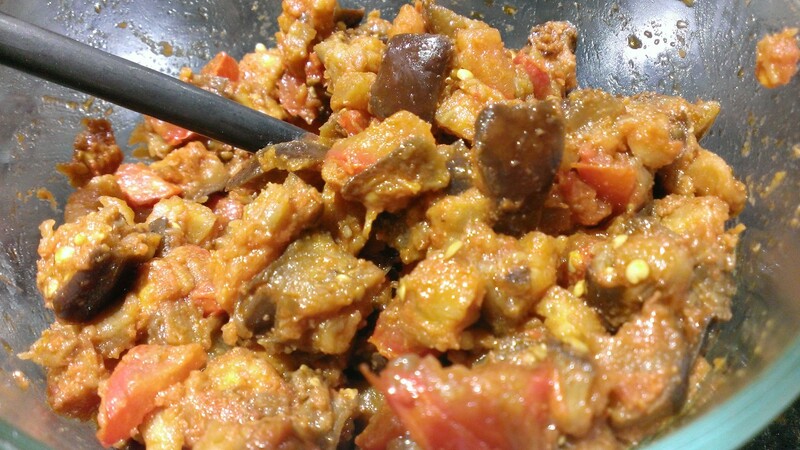 This delightful eggplant salad has a tasty middle eastern flair! Lightly coat the bottom of a large 9x13 shallow Pyrex baking dish with oil. Trim each eggplant and cube into 1/2 inch sized cubes. Cube the tomatoes as well. Mix all the ingredients thoroughly in a bowl. Spread the mixture evenly in a single layer in the baking dish and place the dish in the oven, stirring every 20 minutes until soft. When done, add salt and pepper to taste and mix well. Adding a dash of smoked paprika can help the flavor pop. We tend to add a bit more smoked paprika in the winter. We like to eat this both warm or cold!